As the iPhone 4S launches today in seven countries (US, Canada, Japan, Australia, UK, France, Germany -- our launch coverage here), many customers are finding out for the first time that Siri, the voice assistant Apple announced and demoed at the Let's Talk iPhone media event last week, has some limitations outside the United States. Several websites reported that Yelp integration for local businesses wouldn't be available outside the US initially. Siri is still in beta, available in a few languages, and Apple has already announced that more languages and services will be available soon. 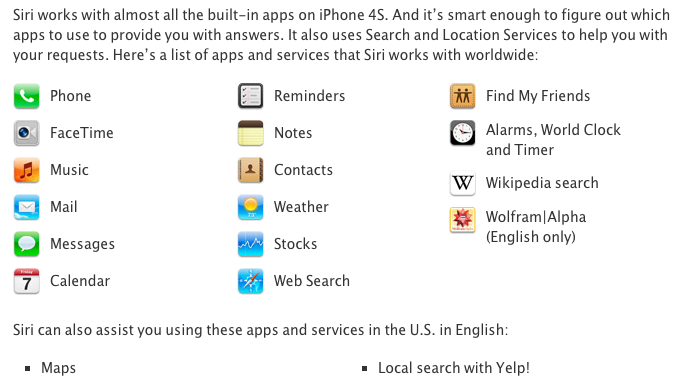 On Apple's website, the Siri page reports in a footnote: "Siri is available in Beta only on iPhone 4S and requires Internet access. Siri may not be available in all languages or in all areas, and features may vary by area. Cellular data charges may apply." Some of the early reviews of the iPhone 4S briefly touched on the subject of limitations outside the United States and mentioned Siri could have some issues with some very specific accents (albeit the software does recognize the difference between U.S. English, UK and Australia); as customers get their hands on the iPhone 4S today, features that have been omitted from the first version of Siri outside the US are starting to surface online. Electricpig was first to report maps and directions wouldn't be available to Siri except for US customers; today, a number of users have confirmed that both businesses (with Yelp integration) as well as maps/traffic data aren't available outside the United States. 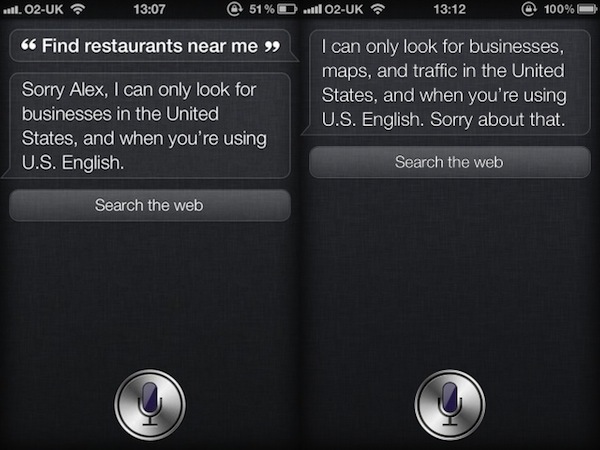 When asked for Maps information in the UK, Siri says "I can only look for businesses, maps, and traffic in the United States, and when you're using U.S English. Sorry about that." (thanks, Sam). 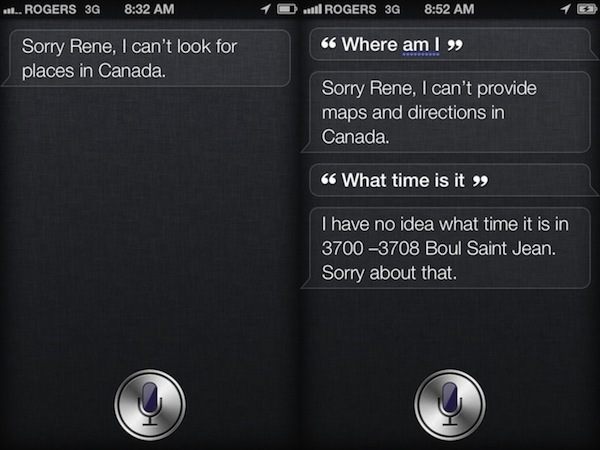 Rene Ritchie of TiPb has also got his iPhone 4S, and confirmed Siri can't "provide maps and directions in Canada" and "look for places in Canada". From the screenshots, it appears Siri fetches the current location, but can't provide additional information through Maps or Yelp integration yet. Furthermore, we've received a number of reports from French and German users unable to look up data on Wolfram Alpha through Siri, suggesting that Wolfram integration is only available to English-speaking countries for now. 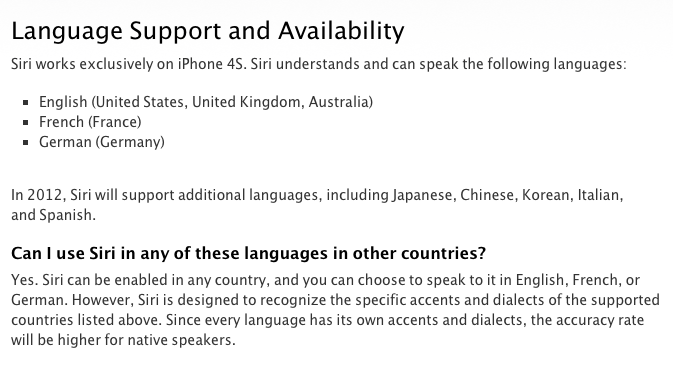 Maps and Wolfram aside, Siri's basic functionalities have been ported over to non-English speaking countries. French website iGeneration [Google Translation] has posted a video walkthrough of Siri in French, showing various features including SMS and Reminders support. The website claims, however, that the French version of Siri "recognizes fewer variants of the same question, is less varied in his answers, and has less humor" than the US edition. They also add that, in general, voice recognition is "pretty impressive". As for the humor, perhaps Apple didn't have time to build in the same easter eggs found in the US Siri. Again, Apple had already confirmed that some features of Siri may not be available in all countries on day one -- it wasn't clear exactly how the ones that wouldn't find their way outside the US would look inside Siri's interface until today. We'll post more details on international Siri usage and functionalities as we get them.